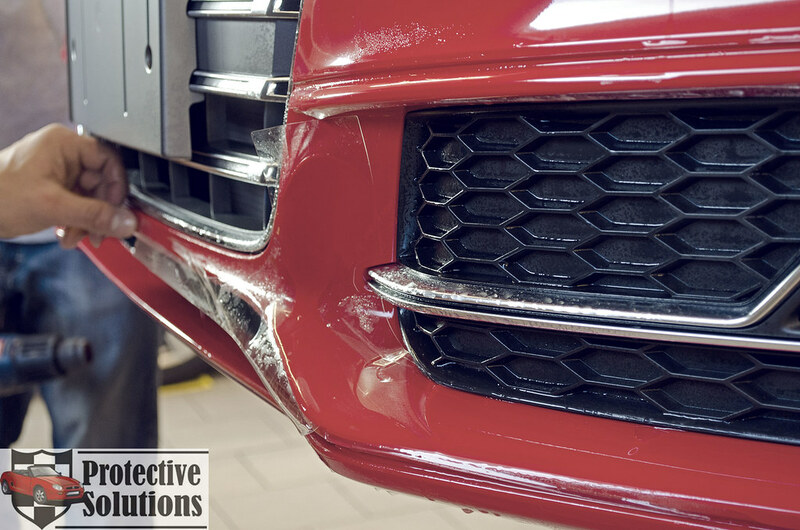 Here at Protective Solutions we have had a wild summer protecting your vehicles so your paint remains show room shiny for everyone to see. We have had everything from enthusiast race cars to your family mini vans and more. It is never the wrong time to protect your vehicles paint but with summer still very present make sure you are taking advantage of it. Check out the gallery and the rest of our website for more information and pictures of our latest installations and see exactly how your vehicle will be protected. Contact us today! 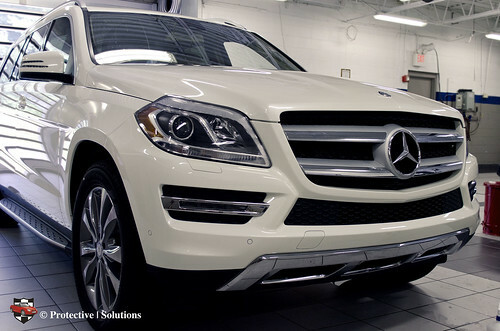 For the best paint protection you will never see! 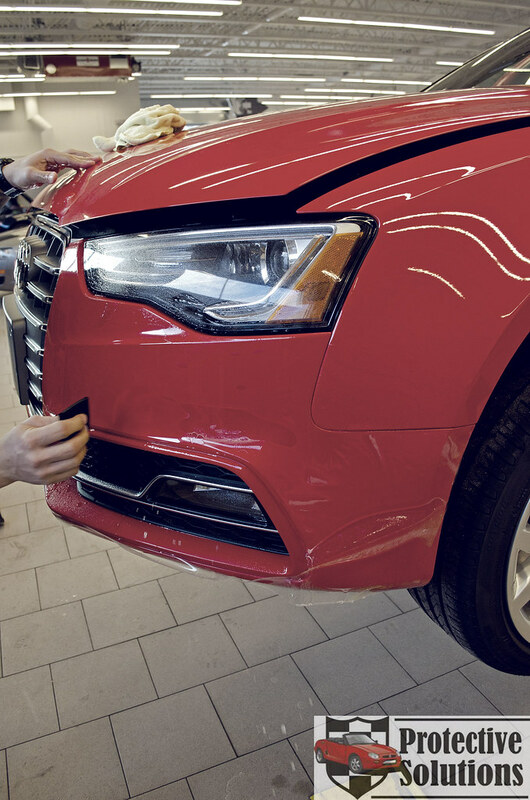 Whether it be full coverage or custom areas, whatever ideas you have for paint protection on your vehicle we’ve got it covered. 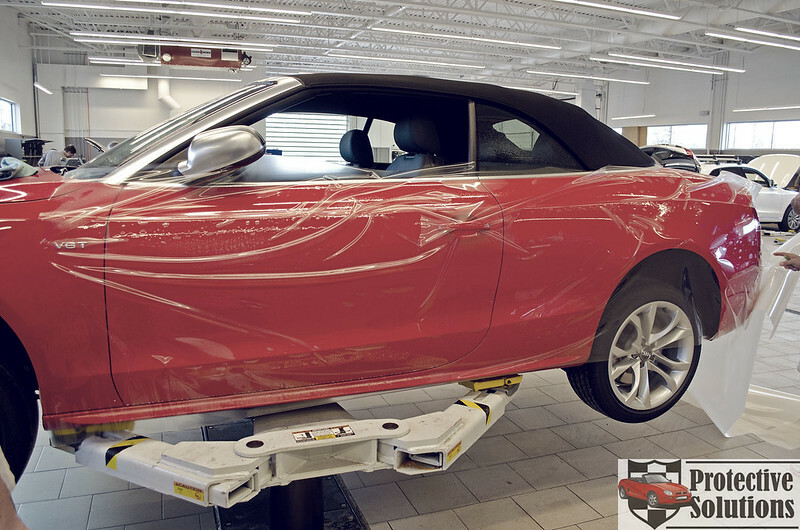 Our certified installers can handle whatever is thrown at them and even without pre cut pieces we are able to cover every inch of your vehicle. 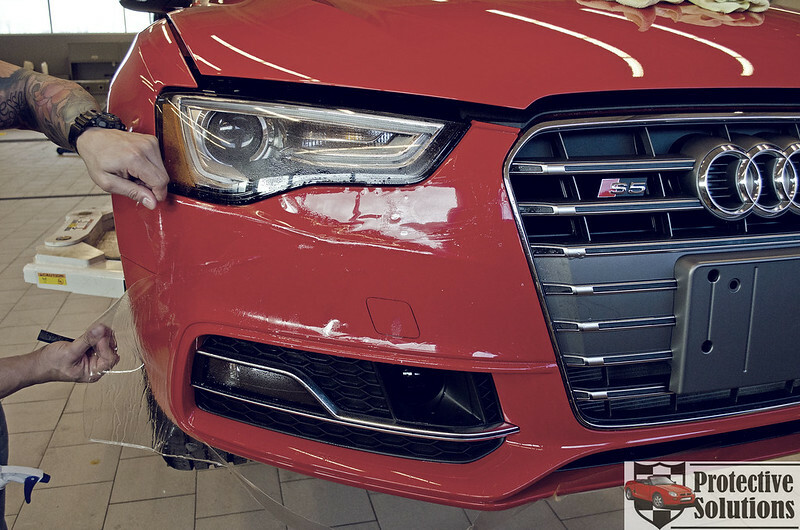 We had an amazing opportunity last week to do a full coverage install on a brand new Audi S5. 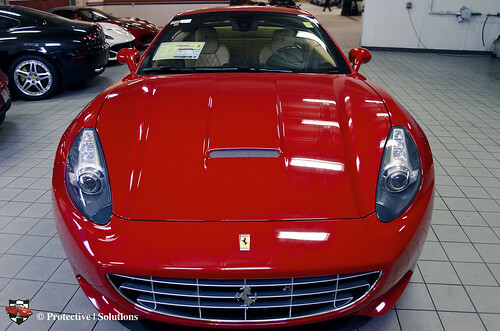 This car is absolutely stunning inside and out, and what better way to protect that Misano red pearl paint than our very own PremiumShield paint protection film. 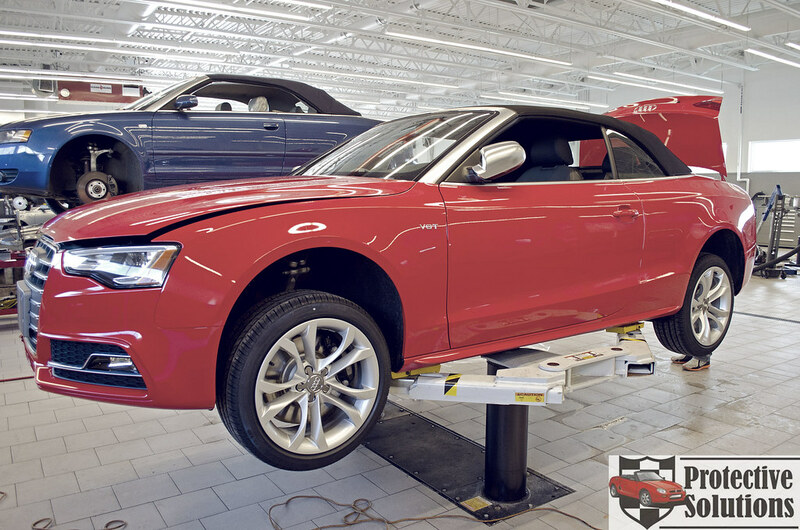 This installation covers the front bumper, full hood, full fenders, doors, rocker panels, rear quarters, trunk and rear bumper. 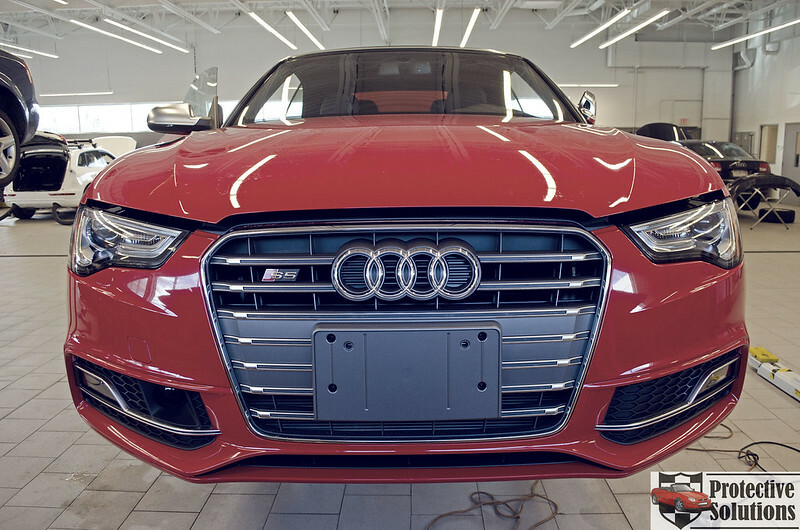 As Audi changed body styles, their front grilles have grown larger, many other manufacturers have chosen to do this as well. This makes the front bumper split into two pieces along with a separate piece for the lower skirt. Here our certified installer is positioning the film to cover the passenger side of the bumper. The difficult part of an install such as this, is that most of the car is custom coverage. Meaning that in some cases there is not a pre cut piece and we make it ourselves using bulk paint protection film. This was an amazing car to work with and we’re glad to help in protecting this car so it can look brand new for years to come. Full coverage installs and any custom piece you can throw at us are available upon request. Check out the rest of the photos from this install on our gallery page.